We’d love your help. Let us know what’s wrong with this preview of Hero by S.L. Rottman. 15-year-old Sean's got no one to look up to, and nothing left to lose-until he's arrested. The only way for Sean to pay his dues is to perform community service on Mr. Hassler's farm. He can do just what he has to, or he can confront the mess his life has become. It's his choice? To ask other readers questions about Hero, please sign up. kinda cheesey but still good. Hero was a heartbreaking and well-developed book. The author, S.L. Rottman, portrayed the characters in a way that could make one either love or despise them. It's about a 15 year old delinquent, Sean, that attends an under-age drinking party one too many times. Because he already has a criminal record, Sean is given community service. Sean's father is not in the picture anymore and his mother, a drug and alcohol addict, abusive toward him. To top it off, she steals any money he makes to pay for Hero was a heartbreaking and well-developed book. The author, S.L. Rottman, portrayed the characters in a way that could make one either love or despise them. It's about a 15 year old delinquent, Sean, that attends an under-age drinking party one too many times. Because he already has a criminal record, Sean is given community service. Sean's father is not in the picture anymore and his mother, a drug and alcohol addict, abusive toward him. To top it off, she steals any money he makes to pay for more alcohol. Luckily, a kind, elderly man (Mr. Dave Hassler) offers to take Sean in and have him work on his ranch for community service. During his first week at the ranch, Sean and Mr. Hassler come across some strange situations. To find out what happens at the ranch or with Sean's mother read the book! Wonderful read. Look forward to sharing with students next semester. 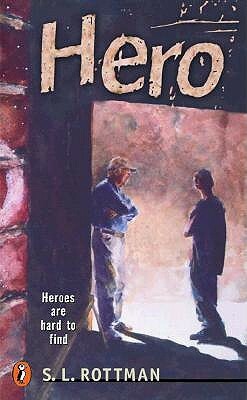 The book that I read was Hero, by S.L. Rottman. The book is about a fifteen-year-old named Sean. He hates the world, therefore he doesn’t care about anyone or anything and he gets in a lot of trouble. He struggles at the start of school and gets sent to do community service. He eventually grows up and gets all his work done. I really liked this book. I liked it because I can somewhat relate. I used to struggle in school a lot and do a lot of bad things. I’ve also had to do community service. I st The book that I read was Hero, by S.L. Rottman. The book is about a fifteen-year-old named Sean. He hates the world, therefore he doesn’t care about anyone or anything and he gets in a lot of trouble. He struggles at the start of school and gets sent to do community service. He eventually grows up and gets all his work done. I really liked this book. I liked it because I can somewhat relate. I used to struggle in school a lot and do a lot of bad things. I’ve also had to do community service. I still am struggling in school, but not as bad. The theme is to not let what other people think of you let you down. Sean shows this by changing how he views life, and how he comes from everyone thinking poorly of him to being a great kid. When he first gets to the ranch, he hates the place and refuses to do his work. Each day he’s there, he improves his work and starts to do it without questioning. He ends up with a great relationship with Mr. Hassler (The Ranch Owner) in the end. I recommend this book to anyone. I think it shows a lot about the realities of life, and shows that life isn’t always sunshine and rainbows. One thing I disliked about the book is the lack of info on Sean’s mom. His mom plays a big role on how Sean acts and how he thinks, and I feel like there should be more info on his mom. Something from the book that I like is how much conflict there is between Sean and everyone around him, it makes you want to keep reading. This book was very entertaining and you won’t get bored of it because of how much conflict there is. Everyone should read this book, it shows the daily struggles that some people go through. It makes you appreciate everyone and everything a little more. It was an amazing book and I enjoyed it very much. dare I give this book a 4 stars? maybe a 3.5, or even a 4 stars with this one. Killer ending, absolutely wrapped everything up. Amazing. I've been so deprived of good literature after reading other supposedly good YA fiction (according to goodreads ratings). This was great book. It's sad that adult realistic fiction is probably dirty (or so I'm assuming from other books I've tried to read in that genre) because they COULD be quite sensible and achieve some sort of literary decency, but I'm not wow. I've been so deprived of good literature after reading other supposedly good YA fiction (according to goodreads ratings). This was great book. It's sad that adult realistic fiction is probably dirty (or so I'm assuming from other books I've tried to read in that genre) because they COULD be quite sensible and achieve some sort of literary decency, but I'm not even going to try to see if there are sensible ones because that's not something I need in my life. good ending, not undeserved. not super happy but not super sad. This book was a true page turner. The writer created situations that allowed you to laugh and cry! I finished this book in one day and that is not something I normally do! I couldn't put it down because the author was able to create characters that I bought into right away! It was truly a wonderful experience. The author causes you to think, to consider another side that you may not have considered before. It was truly a wonderful book. This review has been hidden because it contains spoilers. To view it, click here. This book is a great book. I read this at school as a class, and this book had me hooked. I honestly don't 100% agree that there are no heroes, but I was crying by the end of the book. Sean was actually a hero when ever he jumped in front of Mr. H and then the story ended with his essay, which is kind of ironic. But this is such a great book. I love it so much!!! This book was amazing! I love the way it tells that story from a perspective that not many of us in this century might know of. It tells how someone so tense and uncaring can be a sensitive and caring person. It tells of how one boy becomes a different person. It tells of a hero. Favorite book growing up. I can't even remember how many times I read this! Publication Info: Puffin Books. New York. 1997. Plot Summary: Sean Parker recently entered ninth grade and is having problems academically and socially. His parents are divorced and he lives with his mother, who beats him. The school can’t ever get in touch with her because she sleeps during the day and works at night. Sean gets into a fight with a boy at school, so the principal suspends him for five days. Later that night, he stays at a party until three o’clock in the morning and is caught by the police being out after curfew. He is sentenced to do 80 hours of community service at a small ranch. The ranch owner is an old man who is very particular and won’t put up with any garbage. On Sean’s first day there, a mare gave birth to a foal, which Sean helped to deliver. He became very attached to the foal and was given the honor of naming him. Sean and the ranch owner begin to establish a healthy relationship, and when Sean’s mom beats on him one night, Sean runs to the ranch and sleeps in the stall next to his foal. He feels safest when he is at the ranch. The ranch owner, Sean’s doctor, his teacher, and his judge work together to find out what is best for Sean. After hearing that his mom beats him, it is decided that Sean will no longer have to live with his mom. At the end of the story, a kid from school tries to hide his drugs in the foal’s stall. In the attempt to protect the foal and the ranch owner from being hurt or killed, Sean tried to stop his schoolmate and was shot in the chest. He is put in the hospital and is under constant care of the ranch owner. Those who care about Sean know he will survive because he is tough. Personal Notes: This is a fabulous story, and my plot summary simply does not do it justice. I would love to read it as a class. The element about the English paper on the topic of heroes would definitely be worth a discussion. The class could also talk about whether school is that way for them, what life is like at home, and what they would do in Sean’s situation. Evaluation: This book kind of reminded me about the novel I read having to do with the troubled teen group home. It was nice to have the plot focused on just one teenager, though. I found myself questioning Sean’s motivation to do certain things, which I tend to do a lot with other teenagers. It was nice to finally get some insight into his way of reasoning and attempts to protect himself. Other Comments: This novel was chosen as an American Library Association Best Book for Young Adults. I think it is a great book for adults, too. A very powerful story of an abused teenager who soon comes to trust another human being. 15 year old Sean has been let down his whole life, mostly by his abusive alcoholic mother and his absent father. So when he's told to write an essay for his class about someone he considers his "hero" he comes up blank. Then, not so soon after, a fight lands him suspended and then onto community service due to his record on Mr. Hassler's ranch. Sean is a likable loner, tough as nails, with a survivors sense A very powerful story of an abused teenager who soon comes to trust another human being. 15 year old Sean has been let down his whole life, mostly by his abusive alcoholic mother and his absent father. So when he's told to write an essay for his class about someone he considers his "hero" he comes up blank. Then, not so soon after, a fight lands him suspended and then onto community service due to his record on Mr. Hassler's ranch. Sean is a likable loner, tough as nails, with a survivors sense of humor. He meets his match with a tough Hassler, a WW11 veteran who won't put up with Sean's smart mouth. Their relationship grows stronger throughout the novel and Hassler becomes a fatherly figure for Sean. He disciplines him and makes him do things he's not used to or refuses to do at first, teaching Sean how to cook or makes Sean assist him in a delivery of a premature colt. The novel is filled with melodrama with two scenes that edge towards it: Hassler's fight with Sean's father, and Rick holding Sean at gunpoint. The novel though concludes credibly, Sean has witnessed heroism in everyday acts of courage and Mr. Hassler soon becomes someone Sean's glad to call his hero. The book is about Sean he is a fifteen year old freshman in high school he has been let down by everyone his whole life. Sean has to go to school and write an essay about a hero but he doesn't have one because everyone has always been downgrading him his whole life so he didn't do the essay. Sean gets caught for a mounting police record so he gets suspended from school now to pay his dues he has to community service on Mr. Hassler's farm. Mr. Hassler is a world war two veteran and he doesn't tol The book is about Sean he is a fifteen year old freshman in high school he has been let down by everyone his whole life. Sean has to go to school and write an essay about a hero but he doesn't have one because everyone has always been downgrading him his whole life so he didn't do the essay. Sean gets caught for a mounting police record so he gets suspended from school now to pay his dues he has to community service on Mr. Hassler's farm. Mr. Hassler is a world war two veteran and he doesn't tolerate Sean's smart mouth so If Sean talks back Mr. Hassler will wash his mouth out with soap. Mr. Hassler gains trust by fostering Sean's self confidence he taught Sean how to cook and makes Sean assist him in the delivery of premature colt. Mr. Hassler's fist fight with Sean's father and Rick holding Sean at gun point in the denouement. However the book concludes credibly there are no easy answers. Sean has discovered the heroism in everyday acts of courage and his message is a powerful one for adolescents. Hero, written by S.L. Rottman, is a well written story about a boy who’s life is changed by the influence of a man who helped him while serving community service hours. Rottman wrote an inspiring novel about the influence of peoples decisions and how the opportunity to change is up to yourself. Sean is a young boy who is scarred by the challenges of life. His father left their family when he was young and his mother is neglectful and abusive. He takes his anger out on others and after many fight Hero, written by S.L. Rottman, is a well written story about a boy who’s life is changed by the influence of a man who helped him while serving community service hours. Rottman wrote an inspiring novel about the influence of peoples decisions and how the opportunity to change is up to yourself. Sean is a young boy who is scarred by the challenges of life. His father left their family when he was young and his mother is neglectful and abusive. He takes his anger out on others and after many fights, he is suspended and forced to get community service hours. Sean attends a ranch in which he will clean stalls and take care of the horses. One night a mother horse gives birth to a foal who takes a liking to Sean. Sean soon becomes very attached to the new foal. After many more challenges that come his way he is forced to make an important decision. To find out what Sean’s decision will be read Hero. This book is well written and makes you think about what a hero is to you. While Sean finally finds someone he can look up to, he also starts to get his life back on track. The end will not only touch your heart but surprise you. Hero follows Sean, a fifteen year-old constantly in trouble. In fact, within the first few chapters he's already fighting a one-time friend and, as a result, is forced to complete community service. This is unexpected for Sean, since he's expecting the usual suspension. Even more unexpected, is the fact that his work will take place at a ranch; no place for a city boy. It's here that Sean meets Mr. H and Knicker, two reasons Sean begins to confront his life and turn it around. I would recommend Hero follows Sean, a fifteen year-old constantly in trouble. In fact, within the first few chapters he's already fighting a one-time friend and, as a result, is forced to complete community service. This is unexpected for Sean, since he's expecting the usual suspension. Even more unexpected, is the fact that his work will take place at a ranch; no place for a city boy. It's here that Sean meets Mr. H and Knicker, two reasons Sean begins to confront his life and turn it around. This is a quick read heartily recommended by my 6th grade son. He loved the book and couldn't wait for me to read it. After completing the book, I was thrilled that he enjoyed it. This is not a story for adult readers per se as the theme is overdone in literature. However, as a story written to appeal to an adolescent boy, it's well done. It's a story about a 15 year old boy, with the deck stacked against him. With the help of a couple of adults, he, Sean, was able to pull himself out of his cir This is a quick read heartily recommended by my 6th grade son. He loved the book and couldn't wait for me to read it. After completing the book, I was thrilled that he enjoyed it. This is not a story for adult readers per se as the theme is overdone in literature. However, as a story written to appeal to an adolescent boy, it's well done. It's a story about a 15 year old boy, with the deck stacked against him. With the help of a couple of adults, he, Sean, was able to pull himself out of his circumstances and direct his life in a positive direction. Sean learned how to care for others and he learned the rewards of hard work through his relationship with Mr. Hassler, owner of the ranch where Sean was doing community service. There are parts of the book that are a little mature or "rough" for a 6th grader, but appropriate in the context of the story. The reason I gave this 3 stars is that overall, I did not like the ending. I felt it was not consistent with the rest of the story, especially for the adolescent reader. Otherwise, a good read with a good message. Imagine having a mother who doesn’t seem to know you exist. Unless she needs money or someone to take her frustrations out on. Imagine having a father who hasn’t had contact with you in two years, even though he lives only a couple of hours away. A father who kept taking you back to an abusive mother until he became too busy to even come see you at all. Sean just plain doesn’t care anymore. So he’s been suspended yet again for fighting – big deal. It’ll be just another vacation. That is, until he Imagine having a mother who doesn’t seem to know you exist. Unless she needs money or someone to take her frustrations out on. Imagine having a father who hasn’t had contact with you in two years, even though he lives only a couple of hours away. A father who kept taking you back to an abusive mother until he became too busy to even come see you at all. Sean just plain doesn’t care anymore. So he’s been suspended yet again for fighting – big deal. It’ll be just another vacation. That is, until he’s assigned community service at a local ranch. Starting immediately. Breathtaking and life changing are the two words that I would use to describe this book. It is about a 15 year old boy named Sean who has had hard struggles throughout his life. He had an abusive mom and his dad left him when he was young. His parents have abused and neglected him into the wrong path for his life, but he changes that. He gets into trouble for fighting at school and has to do community service at a farm. A man named Mr. Hassler owns the farm and takes care of Sean. Sean takes c Breathtaking and life changing are the two words that I would use to describe this book. It is about a 15 year old boy named Sean who has had hard struggles throughout his life. He had an abusive mom and his dad left him when he was young. His parents have abused and neglected him into the wrong path for his life, but he changes that. He gets into trouble for fighting at school and has to do community service at a farm. A man named Mr. Hassler owns the farm and takes care of Sean. Sean takes car of a horse name Knicker and this helps him escape his terrible past. Sean's mom becomes severely ill and Sean gets to see his dad. His dad still thinks Sean is useless an his mom doesn't care about him, so he stays with Mr. Hassler and changes his life around. I would recommend this book to anyone, even if you don't like reading it is heart touching!